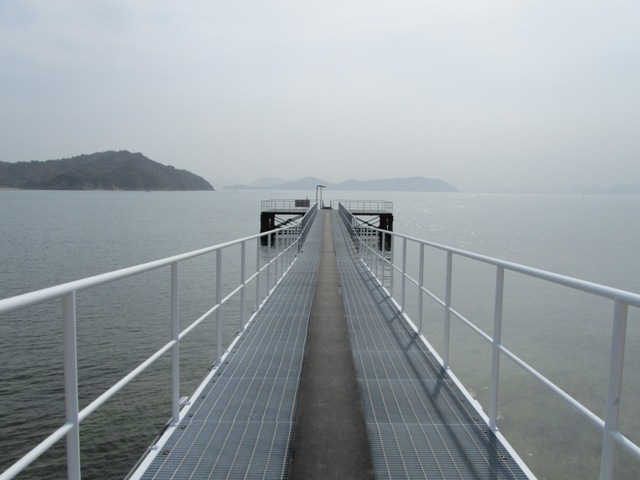 I had visited Naoshima during the 2013 Setouchi Triennale, but I was only there for an afternoon because of how the ferry timetable worked out for us. 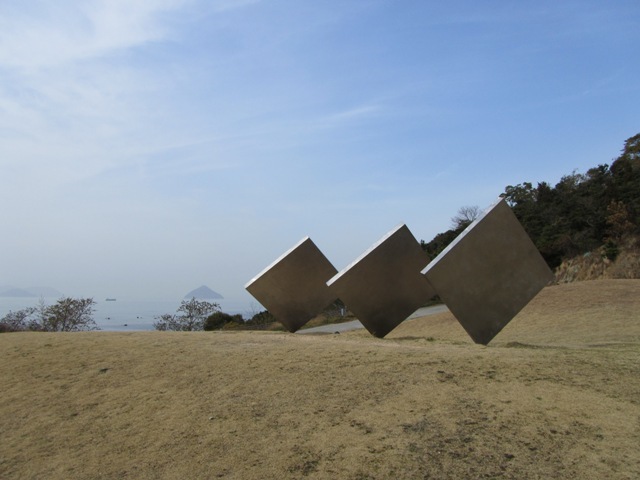 We had cycled over to the Honmura Art House Project and then to the Benesse House Museum to see the outdoor artworks. I wanted to go back and see the other attractions attractions on the island, so I treated myself to an overnight stay at the Benesse House! After checking in, the first thing I did was to go to the sento I Love Yu 「I♥湯」(a pun on the Japanese word for hot water yu), a public bathhouse that’s also an art installation. 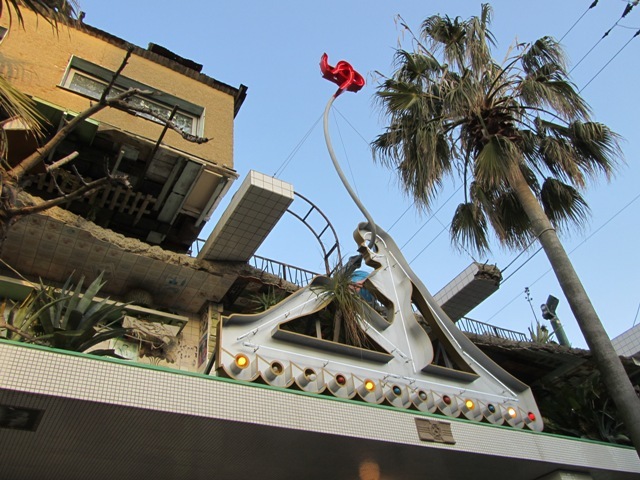 It’s wonderfully kitschy – there are collages everywhere and in the changing rooms there is footage of ama divers, women who would strip down to a loin cloth and a rope connecting them to a boat as they dived for pearls or shellfish. 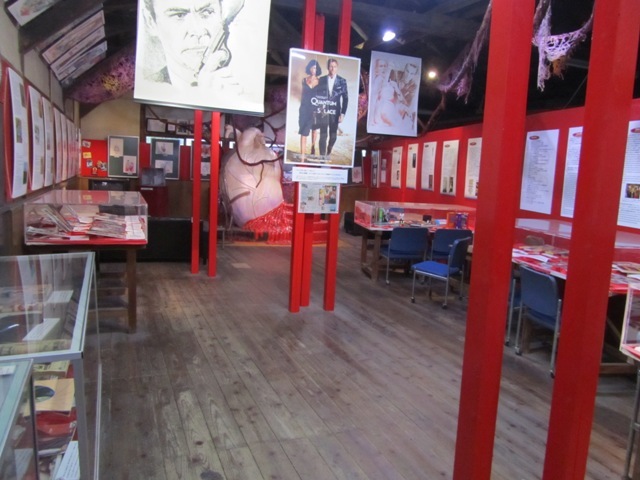 Near the sento was another unique little spot – the 007 Museum, which is dedicated to the 2002 James Bond novel The Man with the Red Tattoo, in the hopes that it will someday be made into a film. 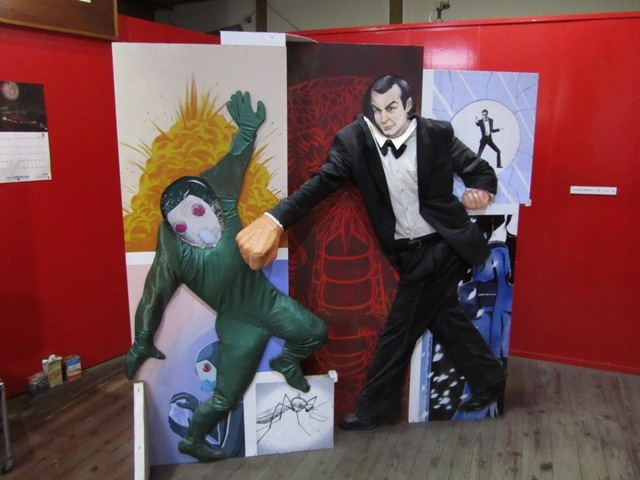 There is Bond book and film paraphenalia and a huge red heart made by some local art students. A little surreal. 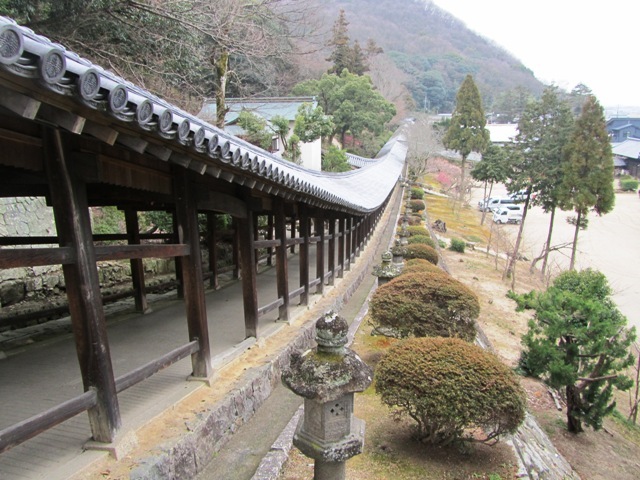 I didn’t stop at Honmura Village, but used the Benesse House shuttle bus to travel between Miyanoura for the sento and 007 museum, and the Benesse House Museum area. 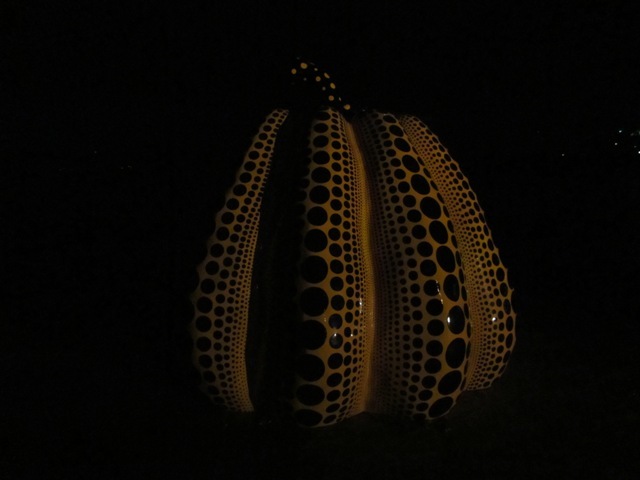 The museums are not far from each other, and along the way you are constantly surprised by works of art. The weather was beautiful, like a cool mediterranean summer, and it was really peaceful, being midweek; the only other visitors I saw were small groups of Chinese tourists and pairs of Japanese or foreign arty-looking young people. 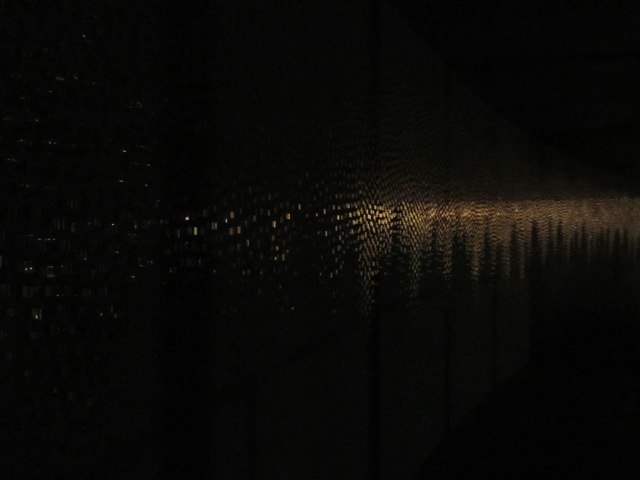 The only disappointment of my trip was the Lee Ufan Museum. 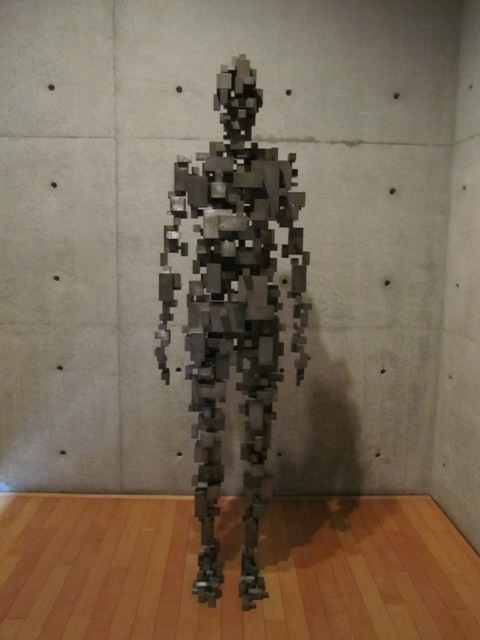 As with the Benesse Museum and Chichu Art Museum, I went there with an open mind and no particular knowledge about the artist. Lee was born in Korea and lived in Japan from the 1950s, having an important involvement in the Japanese art scene in the ’60s. 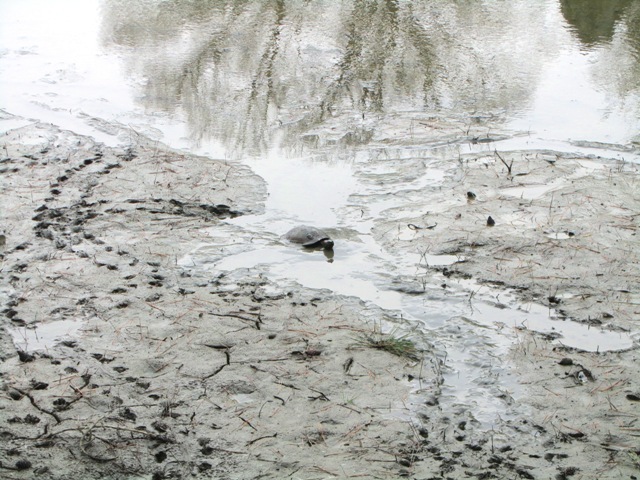 His paintings mainly consist of single large blue or black brush strokes, and his sculptures often use rocks and steel plates arranged together. 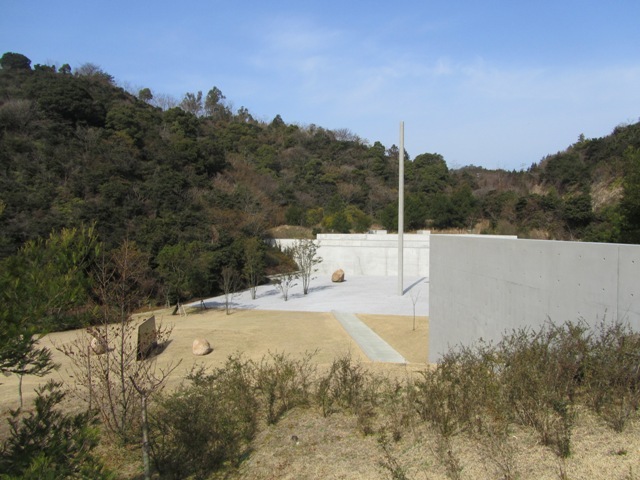 I didn’t find anything objectionable about his art, although it didn’t speak to me personally, and it was housed in a Tadao Ando-designed museum, but afterwards I felt the ¥1,030 I paid for admission would have been better spent elsewhere. There were only three not-very-large rooms with a few paintings and sculptures, and although one of them was a Meditation Room where you take off your shoes to enter the white room with three large square brush-strokes painted directly onto the walls, I didn’t find the museum particularly meditative. Unless you are already a fan of his work, I would recommend just entering as far as the ticket office so you can walk through the concrete passage and get a feel of the architecture, but then save your money for the ¥2,060 admission to the Chichu Art Museum up the road, which is well worth the price of admission, with incredible architectural spaces designed by Tadao Ando, monumental contemporary art by Walter De Maria and James Turrell, and classic paintings by Claude Monet. 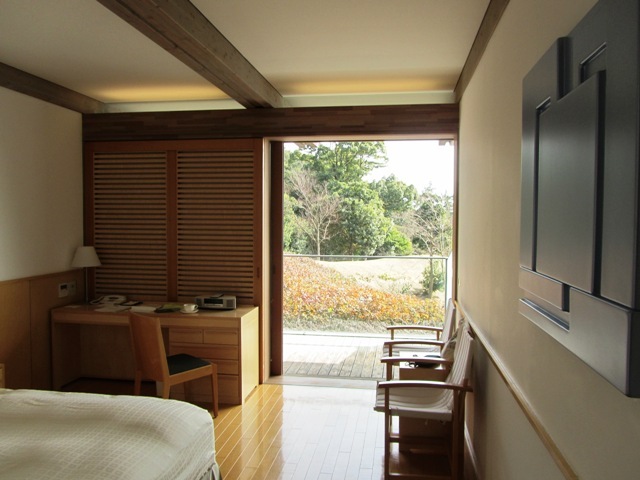 Accommodation is not usually something I will spend much money on, but I made an exception on this trip because I’ve wanted to stay at the Benesse House since I read about this writer’s experience there when the museum had closed for the evening. 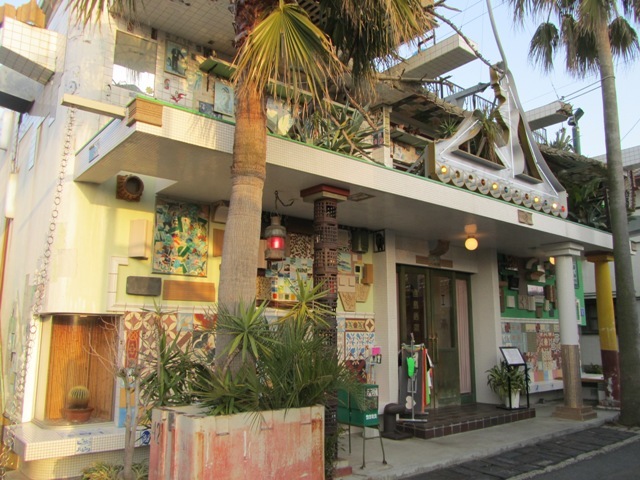 There are four different buildings you can stay in – Oval, Museum, Beach or Park. 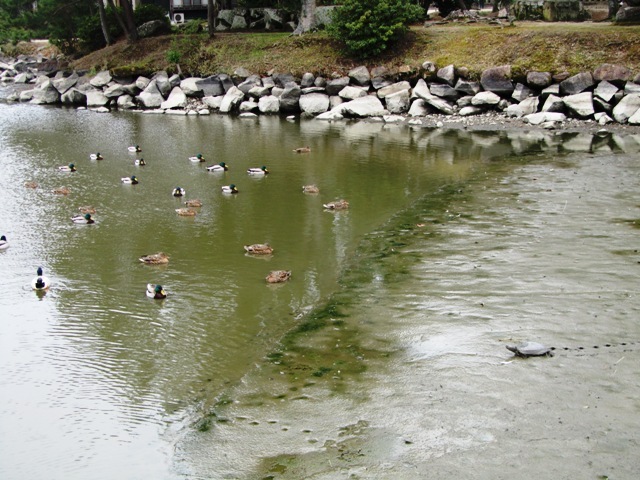 I stayed at the Park, which was very luxurious in its simplicity, and when I arrived in the afternoon, I just sat for a while with the balcony door open, looking out at the artworks on the lawn and listening to the sound of the sea. Although it can be an expensive visit to the island if you go to all the museums, stay at the hotel and eat at the hotel’s haute-cuisine restaurants (I didn’t, but I imagine that would be an amazing culinary experience), but it doesn’t have to be an extravagant trip. 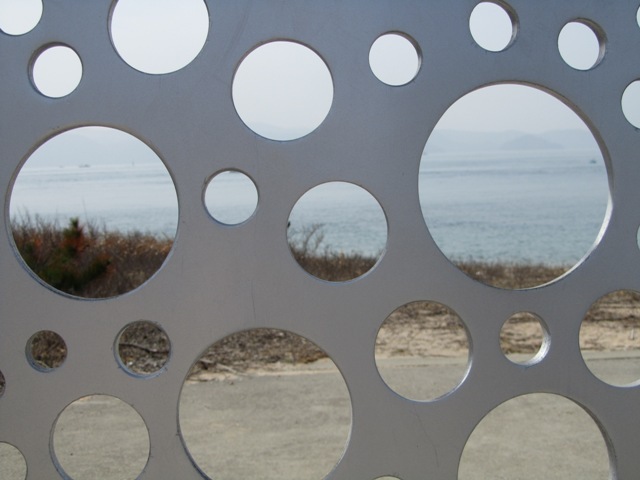 There are so many free or inexpensive art installations scattered around the island, you can stay at local guesthouses or come for the day from nearby Takamatsu or Uno, and the beauty of the island itself is free. 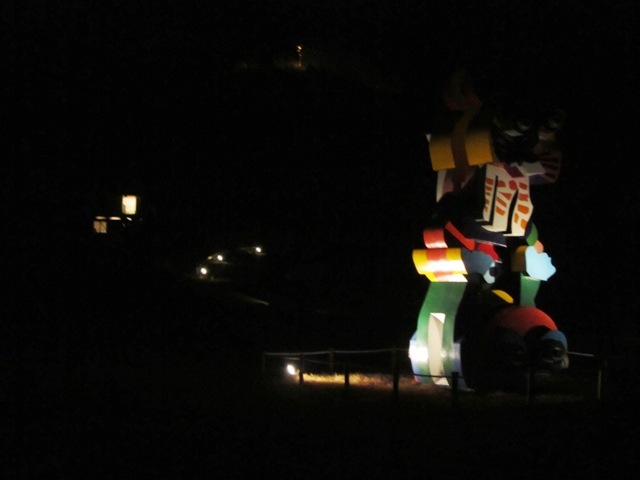 I visited the Benesse Museum which was about a five minute walk up the hill and I wandered around the quiet exhibits as it gradually got darker and when I walked back, I passed the outdoor artworks lit up for the night. 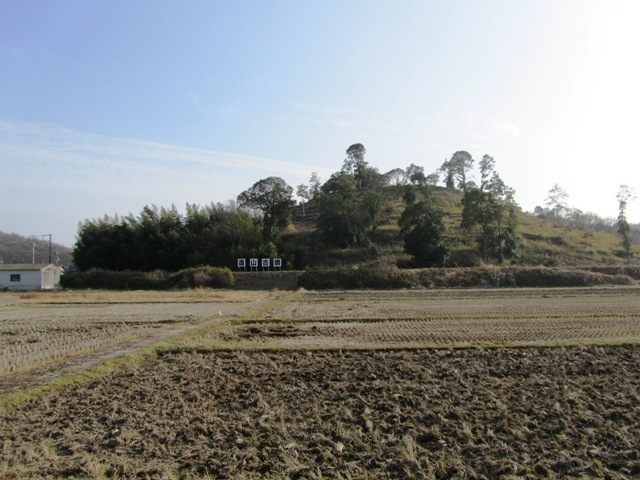 I was in Okayama on a Monday when all the museums are closed, so I took a 10 minute train ride to Bizen-Ichinomiya Station and rented a bicycle to go exploring the Kibi Plain. 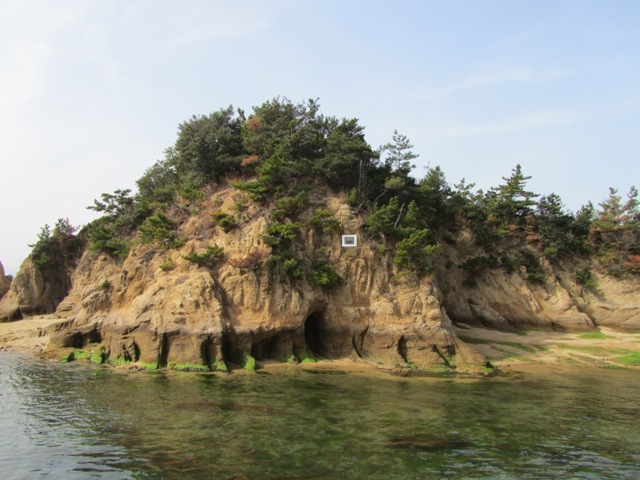 This was the site of the Kibi Kingdom which was very powerful in 4th century Japan, with its strategic position between different tribes in Japan and its connections with kingdoms in Korea. 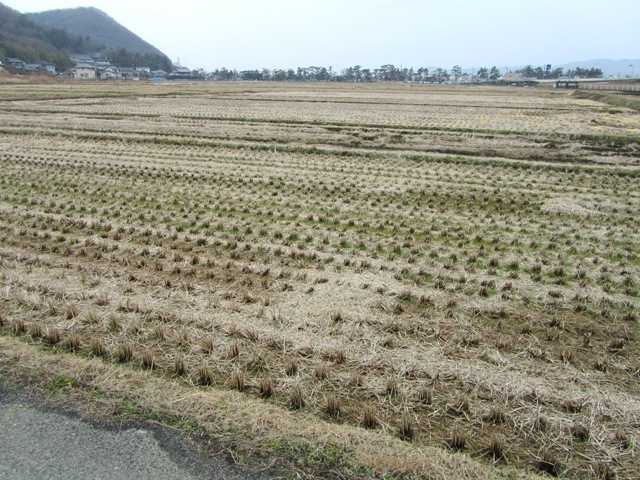 It was a really nice cycle through rice fields, passing temples, historic sites, and sites connected to the legend of Prince Kibitsuhiko, who was the basis of the even more legendary Momotaro, a hero born of a peach who battled ogres and enjoyed kibi dango, sweet millet dumplings. 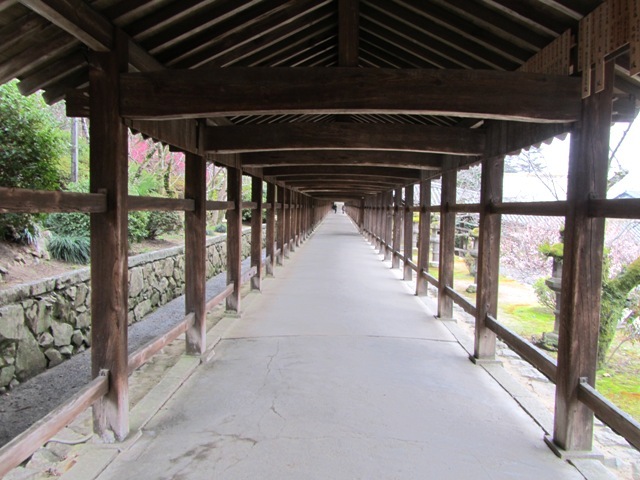 My first stop was Kibitsuhiko Shrine where the prince prayed before going to fight the ogres. 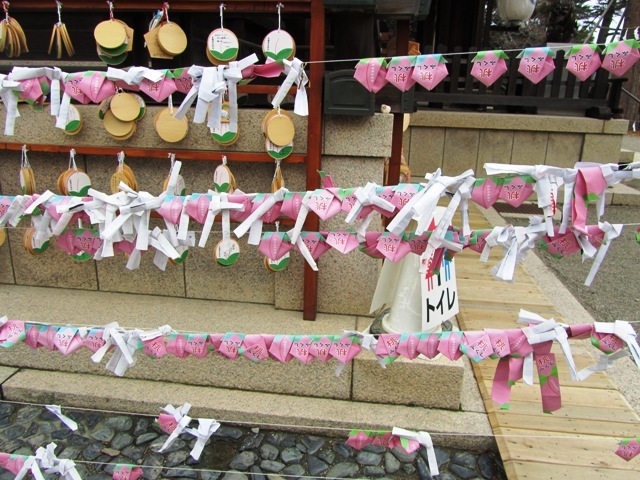 The omikuji fortunes at this shrine are in the form of peaches, in honour of Momotaro, the Peach Boy. 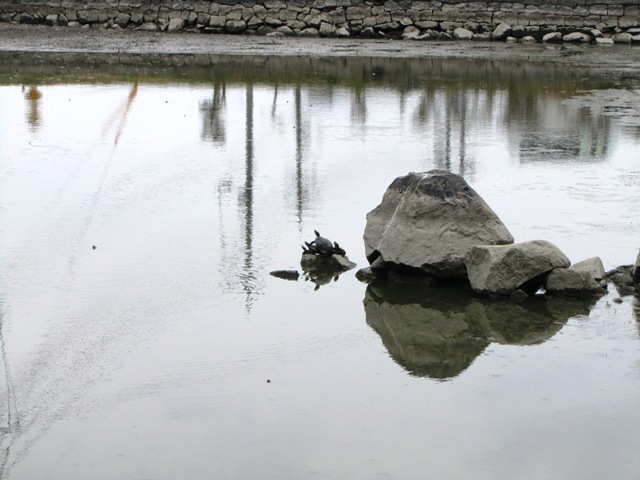 It started out as a dull day, and the rice fields looked very desolate with their burnt stalks. Kibitsu Shrine is where the prince battled the ogre, and it has really long covered corridors which look out on lovely little gardens where the plum trees were blossoming. What I was really excited to see on this trip were the kofun, keyhole-shaped burial mounds dating from between the 3rd and the 7th centuries A.D. that gave their name to that period. I don’t know much about them but they remind me of the megalithic monuments in Ireland, although of course, the ones in Ireland are thousands of years older. 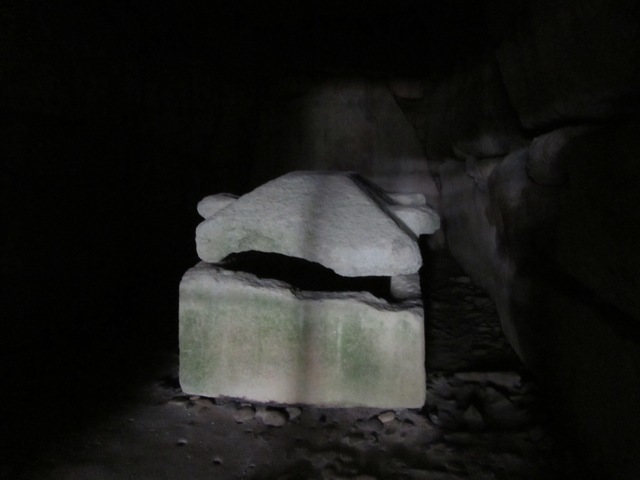 The mounds were build to house tombs of the Kibi royalty, who were interred in stone coffins in the round part of the mound, with swords, mirrors and other accessories. 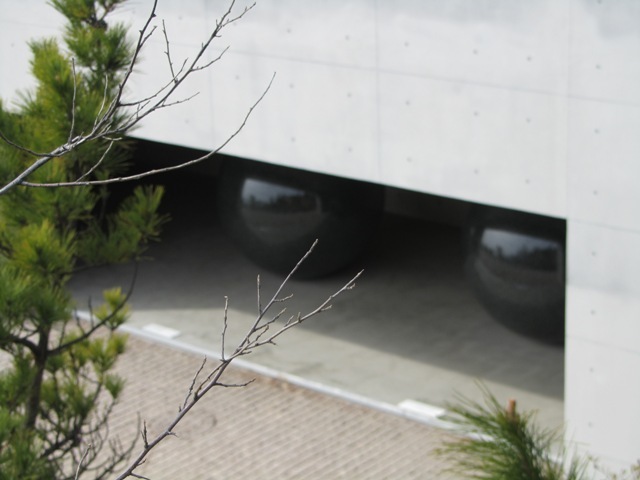 These mounds are really noticeable in Japan because of the lack of hills. It’s either flatland or mountains. 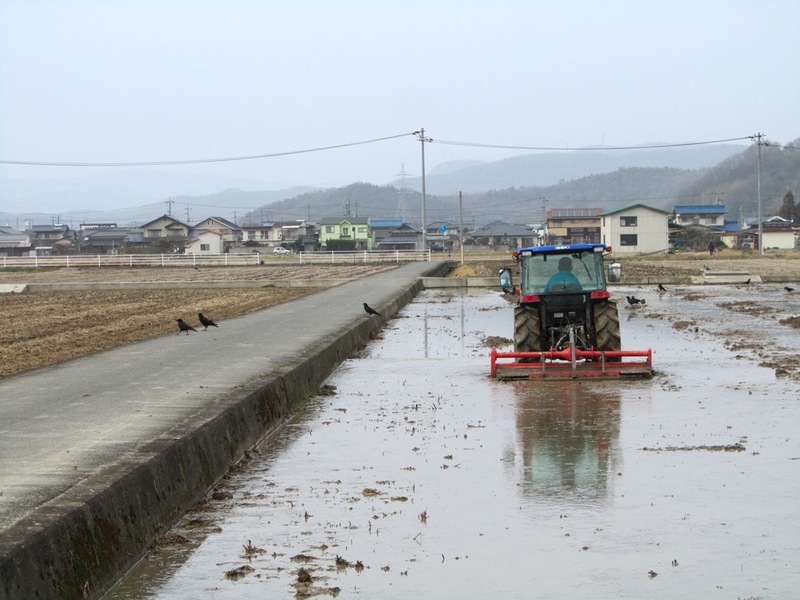 I liked Tsukuriyama because of its rural setting, dividing a tiny hamlet from rice fields. The only tourist facility was a box where you could take a photocopied map of the mound. 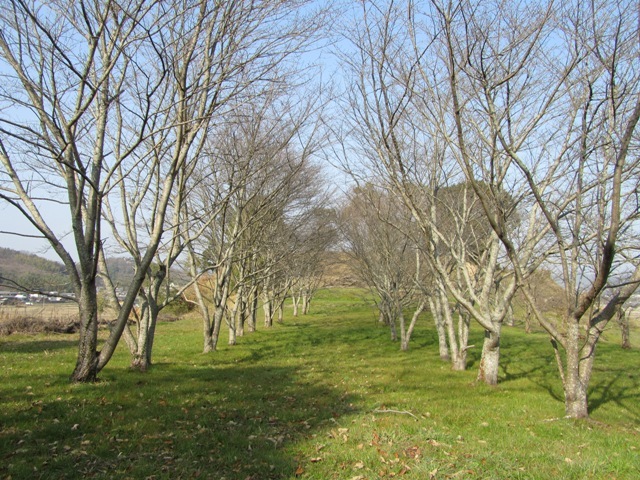 There was a shrine built over where the grave would be on the circular part, and then two rows of trees going down to the squared-off end. The sun came out and cast a golden light over the rest of the afternoon. 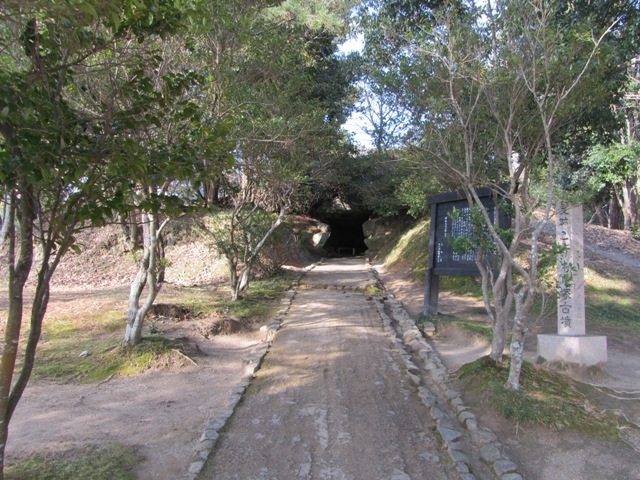 After Tsukuriyama Kofun, I went to Komori Kofun where a tunnel had been excavated into the burial chamber so you could see the stone coffin through a gate. 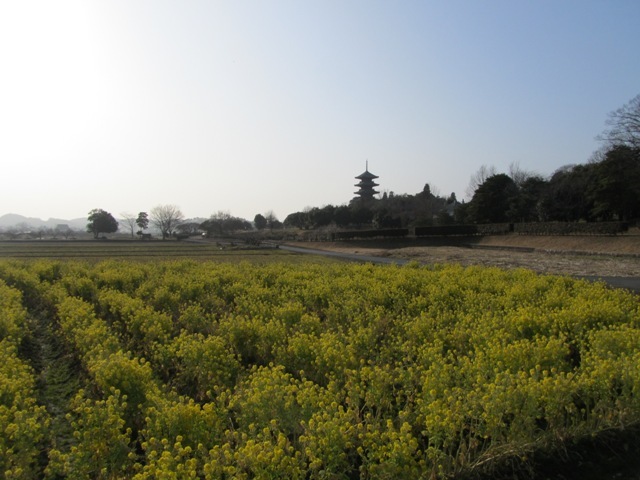 The last notable place on the trail was the Bitchu-Kokubunji Temple with its five-storey pagoda, and the yellow fields of rapeseed made a nice change from the burnt rice paddies. It being a Monday in February, I was the only tourist exploring the plains, the only other people I saw were working in the fields or walking their dogs. 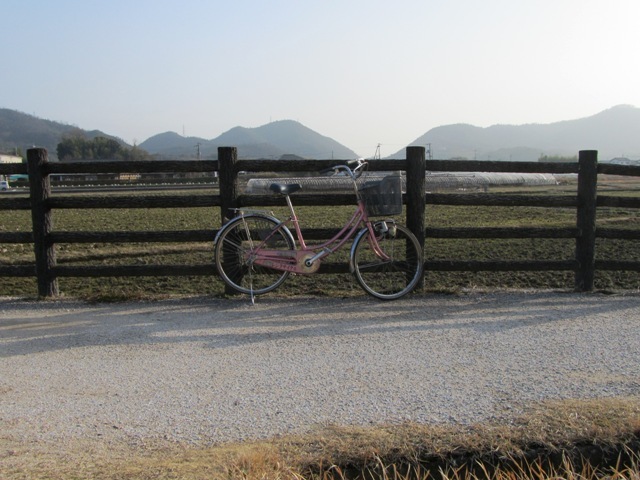 My pink rental mama-chari bicycle served me well and I dropped it off at another bicycle rental shop at Soja, from where I got the train back to Okayama city.